This week has seen an interruption to my usual online witterings. I've spent most of my week away from the computer, talking rubbish elsewhere. It's actually been a very exciting week, beginning with the opportunity on Tuesday to meet the Seven Suffolk Streets project team and the door-knockers, a team of volunteer master composters who are tasked with drumming up residents' support for the Waste Reduction Fortnight that's taking place in March. I'll be joining them soon, knocking on doors across different areas of Suffolk to talk rubbish with other folk who live in my county. So watch this space for further news. Yesterday, I'd also been invited to speak at Inspire East's community champion event, which launched their community empowerment programme. It was a really inspiring event and as well as having the chance to promote the idea of reducing waste and the results of last year's Recycle Week challenge in Moreton Hall, I also had the opportunity to meet some fabulous people and explore the value of working with your local community to promote other sustainable ideas. If you live in the East of England and would like more support on how to empower people in your community to do more, I really recommend you visit the Inspire East website. And on the subject of communities, tomorrow I'll be speaking at the Zero Waste Community event in Norwich about my Zero Waste challenge, as well as hosting a workshop on how to set up a Zero Waste household. It looks like it will be a very exciting day, featuring Richard Anthony from the Zero Waste Alliance, San Diego, Jim Mclaughlin from the Community Recycling Network and Furniture Recycling Network, Maxine Narburgh, Director of the Bright Green Consultancy and member of Zero Waste Europe and Ralph Ryder from Communities Against Toxics. The topics that will be covered include: Zero Waste Communities and Principles; An introduction to climate change Zero Waste and jobs; How to be a Zero Waste home and the Impact of Incineration in Communities. Workshops will include how to develop campaigns for zero waste within your community and how to run community reuse and recycling projects. If you happen to live in the region and would like to attend the Norwich event, you can find the link to the original flyer here. It's an all day programme that runs from 9.30am to 4pm. The latest schedule has since been altered and my presentation has been slotted in at 12pm. So I am afraid with all these to-ings and fro-ings, I've been far too busy gadding around the region or having my head down in preparing PowerPoint presentations that I've hardly had any time to work on my personal declutter challenge. So there's no major update on that today. 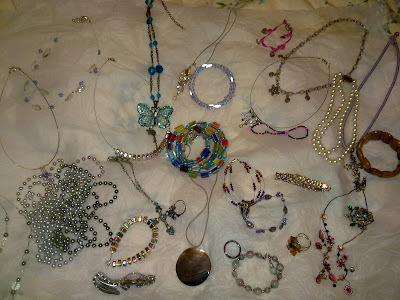 However, I did go through my jewellery box to select a whole host of things for my car boot collection. It only took me about 30 minutes and I was truly amazed at the surplus of jewellery I've been given, made or have bought over the last decade. This is only half of it and I couldn't help wondering how many other women have got collections like this, where most of their items go to waste without use. Maybe if you've got half an hour to spare, you could go through yours too and donate the pieces that you no longer wear to charity or sell online. As well as eBay, there are other fabulous sites such as wicycle-it or even JumbleAid, which helps you support your favourite charity. Alternatively you could keep it in your local community with sites such as Freegle or Freecycle. I knew I was a bit of a magpie but I now intend to be more careful about what I collect in future. At least with my passion for vintage jewellery, there'll be far fewer mass-manufactured adornments from wherever. So I'll be back soon to catch up with all the lovely comments that you've kindly left, but for now, I've got to get my head back down to prepare for tomorrow. Oooo, Mrs A, sorry to be a magpie myself, but if you haven't already got rid of these, there are a couple of pieces in there I'd quite like myself. The blue butterfly is lovely and there's something on the right that looks like just the sort of thing I'm looking for. Also, LMG said to me this morning that she would like a plain silver or gold coloured chain - got anything suitable?? Well done on all your work this week; it's been a great week for both of us! Another magpie here as far as jewellery is concerned. I actually sold some of my gold to one of those rip off places from the telly, got a couple of hundred for it but since think I could have got more. Not to worry, you live and learn. Our recycling bin was emptied for the first time last week since before Christmas. I had nowhere to put my cardboard and recycling stuff. Bags of bags in bags and even more bags!